British biologist, Sir John Betrand Gurdon, FRS, was awarded the Nobel Prize for Physiology or Medicine for the discovery that mature cells can be reprogrammed to become pluripotent (transform into any other type of cell). This process is known as nuclear reprogramming and is at the forefront of stem cell technology. A mature cell already has an established identity. Nuclear reprogramming wipes this information and transforms it to another kind of cell. It can open up new treatments and therapies for diseases and even repair and replace damaged tissues and organs. Although very similar to how stem cells work and the benefits it brings, nuclear reprogramming differs in that instead of growing pluripotent stem cells, the process uses existing mature cells. This is possible since all cells carry the same DNA, as the cell matures, it differentiates (transform) into a tissue or organ such as the brain, heart, lung, or kidney. To "lock" the cell into its present form, different genes within the DNA is deactivated permanently in each cell lineage. As an embryo grows, after a certain number of divisions, it is no longer possible for cells which have gone down the pathway to become something else. For example heart cells cannot be converted into lung tissue, and muscle cells cannot form bone. Dr John B. Gurdon has published today in BioMed Central's open access journal Epigenetics & Chromatin research showing that histone H3.3 deposited by the histone-interacting protein HIRA is a key step in reverting nuclei to a pluripotent type, capable of being any one of many cell types. 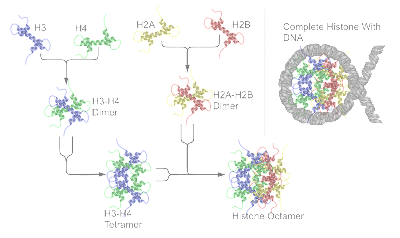 Histones are the major protein components of chromatin. It functions as a regulator in gene activation and acts as the spools in which DNA winds. Without histones, DNA strands would be very long. Human DNA when unwound is 1.8 meters long, histones keeps it wound up to 90 micrometers (0.09 mm). In order to understand how nuclear reprogramming works Dr Gurdon's team transplanted a mouse nucleus into a frog oocyte (Xenopus laevis). They added fluorescently tagged histones by microinjection, so that they could see where in the cell and nucleus the these histones collected. Prof Gurdon explained, "Using real-time microscopy it became apparent that from 10 hours onwards H3.3 (the histone involved with active genes) expressed in the oocyte became incorporated into the transplanted nucleus. When we looked in detail at the gene Oct4, which is known to be involved in making cells pluripotent, we found that H3.3 was incorporated into Oct4, and that this coincided with the onset of transcription from the gene." Prof Gurdon's team also found that Hira, a protein required to incorporate H3.3 into chromatin, was also required for nuclear reprogramming. Dr Steven Henikoff, from the Fred Hutchinson Cancer Research Center, commented, "Manipulating the H3.3 pathway may provide a way to completely wipe a cell's 'memory' and produce a truly pluripotent cell. Half a century after showing that cells can be reprogrammed this research provides a link to the work of Shinya Yamanaka (who shared the prize), and suggests that chromatin is a sticking point preventing artificially induced reprogramming being used routinely in the clinic."